BabyOrganix's Member can earn 221 Points! Baby’s delicate hair and skin gets the perfect balance of cleansing moisture and the kindest care in our softly lathering cleanser. It’s a gentle wash that retains moisture of your kid’s skin, leaving them feeling soft and smooth. Formulated with the mildest organic and natural plant-based cleansers, it’s gentle and tear free. This gentle yet effective formula which is enriched with Cucumber, Aloe vera & Vitamin E turns on ordinary bath time into a full body pampering. This product is Naturally Non-Toxic, Biodegradable, People Balance, Gentle to Sensitive skin, Perfect Friendly, Earth Friendly and 100% Natural. 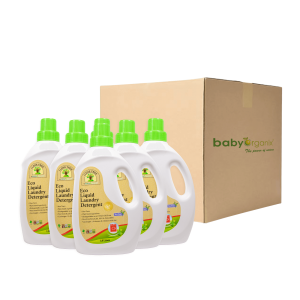 Squirt some BabyOrganix Kids gentle top to toe Cleanser onto your palm or wet flannel. Wipe baby down from top to toe. As for toddler, lather the cleanser from the top and work it downwards to the whole body and rinse thoroughly. Aqua, Disodium cocoamphodiacetate, Cocamidopropyl betaine, Glycerin, Decyl glucoside, sodium lauryl sulfoacetate, Carboxymethylcellulose, Citric acid, Potassium sorbate, Sodium benzoate, Cucumber Extract, Aloe Barbadensis Leaf, Tocopherol Acetate. Aqua,Disodium cocoamphodiacetate,Cocamidopropyl betaine,Glycerin,Decyl glucoside,sodium lauryl sulfoacetate,Carboxymethylcellulose,Citric acid,Potassium sorbate,Sodium benzoate,Cucumber Extract,Aloe Barbadensis Leaf,Tocopherol Acetate.